Founded by Gerd Richard Dorschfeldt in 1980, Gerd Dor distinguishes itself by the ability and perseverance to conceive a piece of art from beginning to end by hand. After an early start in jewellery design, Gerd also gained extensive experience from respected brands that he worked with indirectly, including Boucheron, Fred Paris, Bulgari, Graff, Gübelin and Van Cleef & Arpels. 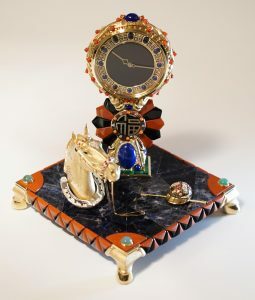 In the 1980s Gerd Dor started developing mechanical art pieces and has since invented mystery clocks and watches, as well as creating spectacular art pieces that incorporate eye-catching jewellery designs and precise mechanical systems. In 2001 he won the Piemonte Eccellenza Artigiana award, which celebrates outstanding craftsmanship.